Wyndham Hotel Group, the hotel giant with an unmatched global presence of more than 8,100 hotels in 78 countries, announced the opening of Wyndham Garden Manama in Bahrain. Wyndham Hotel Group has a management contract with the property owner Mannai Properties, a subsidiary of Mannai Holding SPC, a regional conglomerate. With 441 rooms, this is the largest Wyndham Garden hotel in the world. Wyndham Garden is a hotel brand that focuses on making travel easy and delivering a stress-free experience. 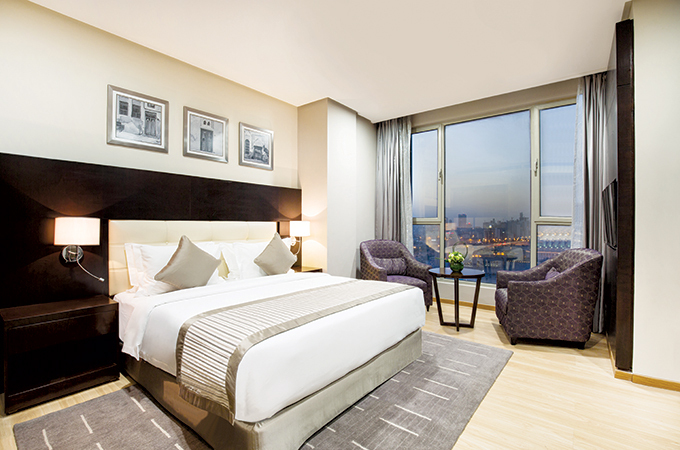 Guests of Wyndham Garden Manama will find peace of mind whether they are travelling for business or leisure. All of the rooms and suites at Wyndham Garden Manama are thoughtfully designed and equipped with deluxe amenities for ultimate comfort and convenience. In addition to elegant deluxe king and twin rooms, and suites ranging from one to three bedrooms, the hotel features high quality leisure facilities including a spa, a beauty centre and salon, a fitness centre with Jacuzzi, and separate steam rooms for gents and ladies. Conveniently located in Juffair and just a 10-minute drive from Bahrain International Airport, the new hotel also offers easy access to the upcoming Oasis Mall in Juffair, the Al Fateh Grand Mosque, as well as many other leisure activities the Kingdom has to offer. Wyndham Garden Manama also showcases an outstanding food and beverage offering, with seven specialty restaurants that bring a wide choice of ﬁne dining experiences to the very heart of Manama. Jashan delights guests with authentic and varied recipes of the traditional Indian cuisine. The all-day dining outlet Café Mosaic offers a wide selection of international dishes prepared at live cooking stations, and is the perfect choice for a business lunch or a casual dinner with friends and family. For a unique Italian experience, Trattoria takes guests through an authentic culinary trip to Italy. Via Brasil is a Brazilian style all-you-can-eat barbeque restaurant, where guests can taste unlimited meat cuts prepared in a traditional ‘Churrasco’ style and served by the restaurant’s ‘Passadores’ (meat waiters). Other outlets include the Players Lounge, a causal gastropub with large screen to catch sporting events from around the world, as well as [email protected], a rooftop bar serving Belgian and German delicacies in a friendly environment, and the Deli Shop, the ideal place to grab a quick drink or meal on the go. Wyndham Garden Manama is also perfectly suited to host meetings and events, offering 171 square metres of event space, including three meeting rooms for up to 180 conference or 200 banquet guests, a dedicated business centre and a VIP Club Lounge. “We are pleased to expand our hotel portfolio with Wyndham Hotel Group with this landmark property in Juffair and we look forward to a long-term relationship,” said Salim Ahmed Mannai, chairman of Mannai Holding SPC. “Wyndham Garden is a brand designed to help guests travel at ease. We are delighted to introduce this exciting brand to Bahrain – the largest Wyndham Garden hotel in the world – by growing our established and important partnership with Mannai Properties. The hotel delivers significant value for guests without compromising on any lifestyle amenity they need for a hassle-free and relaxing stay and is a great addition to our offering in the market. With plans to introduce the brand in more destinations, including Dammam in Saudi Arabia, and Ajman in UAE, Wyndham Garden perfectly complements our growing portfolio of hotels in the wider region”, said Ignace Bauwens, regional vice-president, Middle East and Africa for Wyndham Hotel Group. “This is our second property under the contract with Wyndham Hotel Group and along with Ramada Hotel & Suites Amwaj Islands, this new addition sits well within our strategy of targeting family-oriented travellers,” said Anil Nair, chief executive officer of Mannai Holding SPC. “Wyndham Garden Manama provides flexible accommodation to suit any traveller’s needs. With a wide range of rooms and suites, fantastic food and beverage choices, top leisure facilities, and its outstanding location, the hotel brings a carefree convenience and peace of mind to both business and leisure travellers visiting Bahrain,” said Mukul Mehta, cluster general manager for Wyndham Garden Manama.